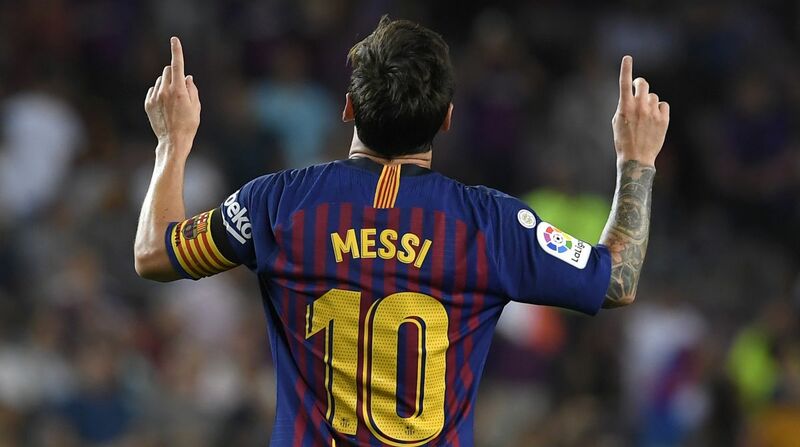 Messi cleverly sent his free kick underneath Alaves’ wall to open the scoring in the 64th minute of Barcelona’s 3-0 win at Camp Nou Stadium yesterday. He also closed the scoring in injury time after substitute Philippe Coutinho had added to the lead in the 83rd. Messi’s low free kick fooled Alaves’ players, who jumped to intercept an expected high shot. Goalkeeper Fernando Pacheco couldn’t get to the ball in time after it suddenly appeared underneath the barrier. Messi, the league’s top scorer last season, had struck the crossbar with a free kick this time over the wall in the first half. He also hit the post from inside the area a few minutes after his opening goal. Messi also scored Barcelona’s 5,000th league goal back in 2009. Barcelona has opened its league campaign with a win for the 10th straight season. Messi’s second goal came in the second minute of injury time, an easy shot from close range after a breakaway. Barcelona had missed chance after chance in its league debut at Camp Nou, which was far from packed with around 52,000 fans for the 10:15 pm start local time. Ousmane Dembele, who started up front with Messi and Luis Suarez, squandered a series of chances, including a one-on-one with goalkeeper Pacheco in the first half. Valverde brought Coutinho off the bench in the second half and the Brazil playmaker added the team’s second goal after a nice play that culminated with an easy strike from inside the area. Alaves had stunned Barcelona at Camp Nou in 2016, winning 2-1. Villarreal entered the new season with high hopes after a solid fifth-place finish in 2017-18, but its disappointing home opener dampened fans’ expectations. Villarreal couldn’t hold on to an early lead at its Ceramica Stadium, losing 2-1 to Real Sociedad. Gerard Moreno, Villarreal’s biggest offseason signing, put the hosts ahead in the 16th before Sociedad came back with goals by Willian Jose in the 40th and Juanmi in the 71st. Villarreal just missed a Champions League berth last season, finishing behind Valencia, Real Madrid, Atletico Madrid and Barcelona. Celta Vigo and Espanyol gave their new coaches a frustrating start in the Spanish league with a 1-1 draw. The clubs hired new managers after disappointing campaigns last season, when Espanyol finished 11th and Celta was only 13th, far from qualification for the European competitions. Mario Hermoso put Espanyol ahead at Balaidos Stadium with a shot from inside the area after a corner just before halftime. Celta equalized early in the second half with an own-goal by David Lopez, who tried to intercept a cross and ended up redirecting the ball into his own net. Real Madrid hosts Getafe in a Madrid derby on Sunday, when it’s also Eibar vs. Huesca and Rayo Vallecano against Sevilla. Atletico Madrid last season’s runner-up visits Valencia on Monday.